The intention to change the demography with the repeal of Article 35 A is largely used for political agenda. Many experts also feel that if Article 35 A becomes unconstitutional than it will immediately nullify all other similar subsequent presidential orders restoring pre-1954 position, thereby, forcing the state into further serious political fallouts of various unpredicted consequences. There are many other states in India who have special category status under Article 371 and its sub-clauses, which are not being challenged by any quarter. Unfortunately, Article 370 in respect of J&K has always remained to boil. Ladakh is a vulnerable area to get penetrated after the repeal of Article 35A because of high potential in tourism and natural resources. Big investors and business tycoon will definitely look forward to opening up their avenues. People of Ladakh will readily sell their lands to the outsiders who will offer a huge amount of money for the land which hardly yields income. Despite Article 35 A imposed in the region, we already have many outsiders who are running their businesses in Ladakh on lease and as a sleeping partner. But if it is revoked everything will be open for outsiders. Employment under the state government confined to the permanent resident only will also be on stake. Many link it with Union Territory status saying that with the existence of Article 35 A in the state UT can’t be approved. This is a complete misunderstanding. The ruling government promises to deliver UT status to Ladakh from a very long time. During every election, they have used the same agenda. BJP didn’t pass any resolution for the UT status in the assembly. If the government is so willful to give us the UT they would have initiated it a long time back but we can’t see any effort or positive outcomes. Prior to getting the UT status, the article is safeguarding our identity and interest. We need to raise voice and discuss on this as we will be targeted and affected at first without its presence. The Congress party is morally supporting the protection of Article 35 A since it has been brought during our regime. The petition filed by a Delhi based NGO 'We the citizen' of RSS affiliation challenged the constitutional validity of the Article 35 A. The petitioner contending that Article 370 is a temporary provision and Article 35 A is against the very spirit of oneness of India which creates a class within India with the restriction of establishment of industries and projects in the state and also violates the rights of women. The petition is filed against the Govt. of India. The central government reluctance and delay in filing a counter affidavit in the Supreme Court of India is raising suspicion and doubt. All this is just spoiling the environment of the state keeping the valley on boiling point for political benefit. The agenda will be withheld and is to be used in the 2019 general election. The people residing in the state are not willing to let go of the Article 35 A as sentiment is involved with it. The government should agree to that either by making the NGO understand or by defending. People should be well aware of the positive and negative effects of Article 35 A. The government of India should defend Article 35 A. A clear intention is needed to safeguard the Article 35 A. Discussion and debate are needed. Tsering Angchuk, President, National Conference, Leh: The instrument of Accession executed by the Maharaja Hari Singh in 1947 with certain conditions came out in the shape of Article 35 A read with Article 370 of the constitution of India. The condition laid was because of the historical reasons when people of the J&K fought for the protection of their right against the non-residents of the state. The influx of people from other states who were far more educated, wealthy and competing made the people of J&K fear of getting dominated at all levels. Therefore, the term 'State subject' was provided on April 20, 1927, to safeguard the interest and rights of the people residing in the state. Article 35 A was inserted in the Indian Constitution by the Presidential order in the year 1954. It gives special rights and privileges to the permanent resident of Jammu and Kashmir in terms of employment under the state government, acquisition of immovable property and settlement in the state and the right to scholarships, and other forms of aid provided by the state government. 1. The limited land owned by the people of Ladakh will be sold to the big industrialist and investors who will definitely offer a huge sum of money for a piece of land. People will readily sell who will offer a good sum of money to the same land which hardly generates income. The people from outside will have money to offer and in this way, we will lose the ownership of our own land. 2. Employment opportunity will be reduced as the youths have to compete with the candidates of other states who are well educated, passed out from premier institutes and more competent. 3. Outsider settlement in the region will create a threat to the existence and identity of the native people. For instance, in the state like Sikkim and Tripura, the outsider settlement is so much that there are only 20 to 25% permanent residents. With the settlement, they can also get the voting rights and then we might lose the seats of nambardars, councillors, leaders and so on. The region is more vulnerable because of its economic potential in tourism, natural resources such as seabuckthorn, Pashmina, solar energy and many more. Today despite having Article 35 A we hear many outsiders operating the business in the district acting as sleeping partners but if this gets revoked than the real investors can openly operate their businesses leaving very less opportunity to the locals. There were cases in the past that few outside traders tried to open a fair in Leh which was opposed by merchant association as it was causing a threat to small local shops. The private rental cars issues and many other such things have been observed by the people during the limited economic season which clearly indicates the threat of getting dominated when Article 35 A will be revoked. Article 35A and 370 is closely aligned since the 35A is a derivative of 370 which ensures to preserve the distinct identity and character of the J&K. The petition filed in the Supreme Court by an NGO seeks abrogation of Article 35 A. There are two different aspects; under constitutional aspect, the Article 35 A is considered the unconstitutional provision of law because it was not being passed in the parliament. Challenging the constitutional application order of Article 35 A means that all other presidential order from 1950 -75 in the state will also have to be questioned. Secondly, from a legal aspect, two constitution benches in 1961 and 1969 upheld the validity of Article 370. The recent issues seem more like a political gimmick spoiling the environment of the state. 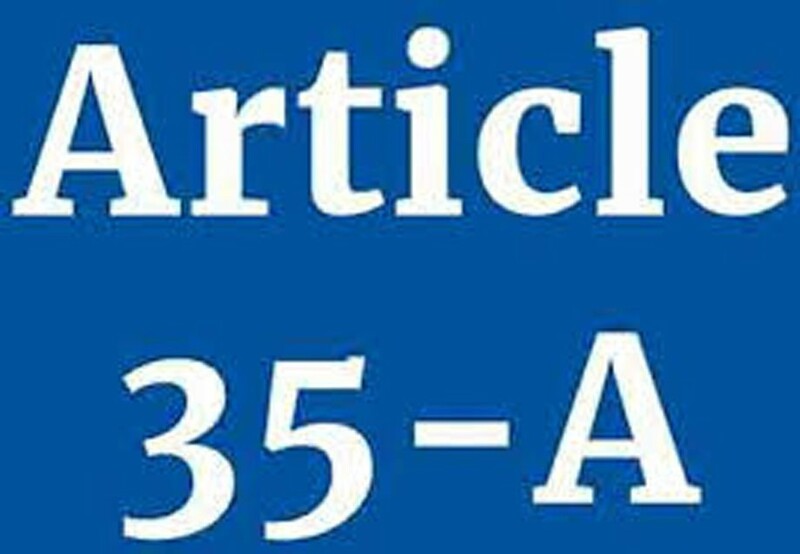 Article 35 A is not a new concept or agenda it has a history and reason behind its existence. There is a need for discussion and to understand the pros and con before coming to any conclusion. More debate and discussion on such an agenda will help in understanding and analyze the positive and negative impact. Being a resident of the state there is a need to understand the various issues and agenda. There is a need for building a public opinion whether Article 35 A is a boon or bane. Need for discussion and debate with all the stakeholders.